Electrical Outlet Height, Clearances & Spacing, How much space is allowed between electrical receptacles, & what height or clearances are required? 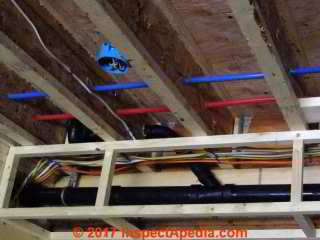 How far should you keep wires away from plumbing pipes or ductwork? 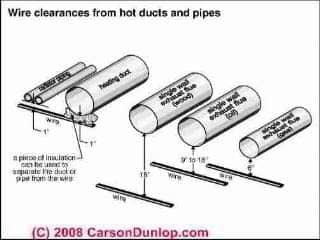 What distance should be kept between electrical wires or boxes and nearby plumbing pipes or HVAC ducts? 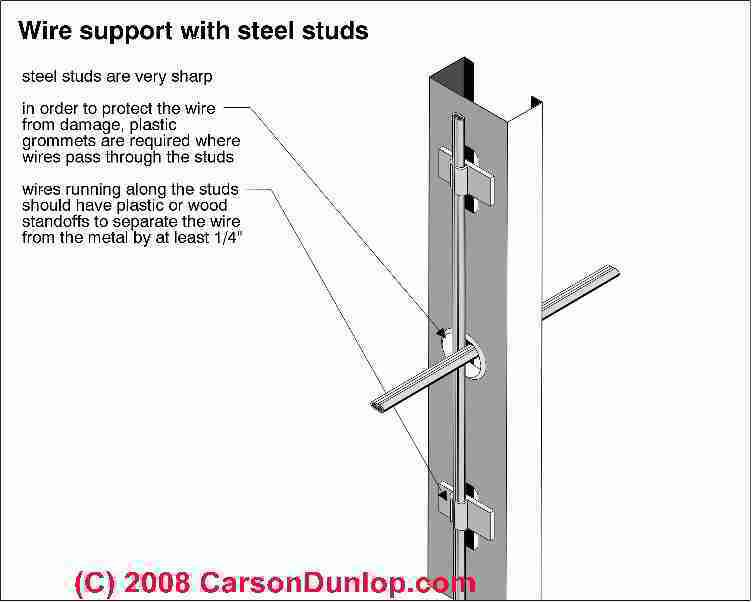 Some basic wire clearance distances are given in Carson Dunlop Associates' skectch above, used with permission. Carson Dunlop Associates is a Toronto home inspection, education, and report writing tool firm. Electrical wire should be kept at least 1" away from radiator piping and heating ducts. 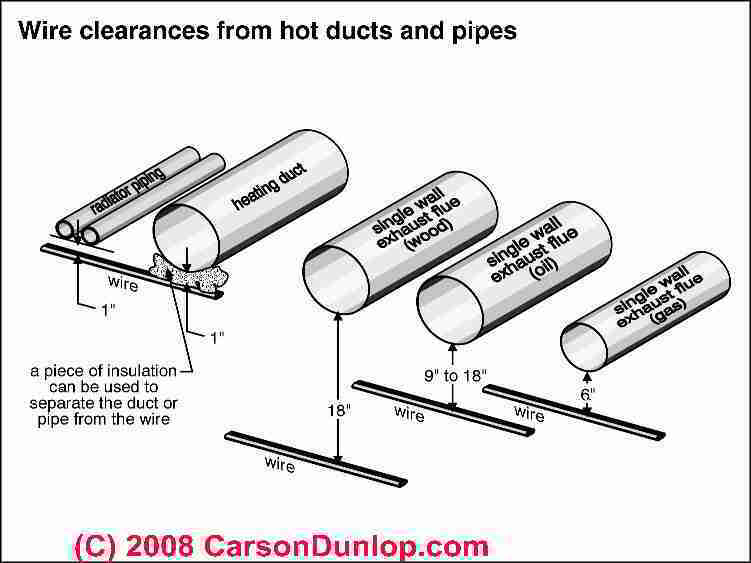 A piece of insulation can be used to keep the wire separated from a nearby heating duct or pipe if necessary. Electrical wire must be kept at least 6" away from a single-wall exhaust flue of gas fired heating appliances. Electrical wire must be kept 9" ti 18" away from a single wall exhaust flue of an oil fired heating appliance like a boiler, furnace, or water heater. We also don't route wires too close to places where the wires can be damaged by heat from a heating appliance or chimney, flooded, etc. as you'll see depicted in the two Carson Dunlop Associates sketches below. Thanks to Steve for pointing out erroneous illustration link details, now fixed. How many electrical receptacles are allowed on a 20-amp circuit? How many receptacles on a 15-amp circuit? Reader question: How many receptacles can be wired To one 20 amp circuit No. 12. Wire - John K.
Our photo (left) shows a 20-Amp electrical receptacle - you can recognize it by that horizontal opening that makes the left-hand slot look like the letter "T" on its side. 13 receptacles on a 20-amp (#12 copper) wire circuit. 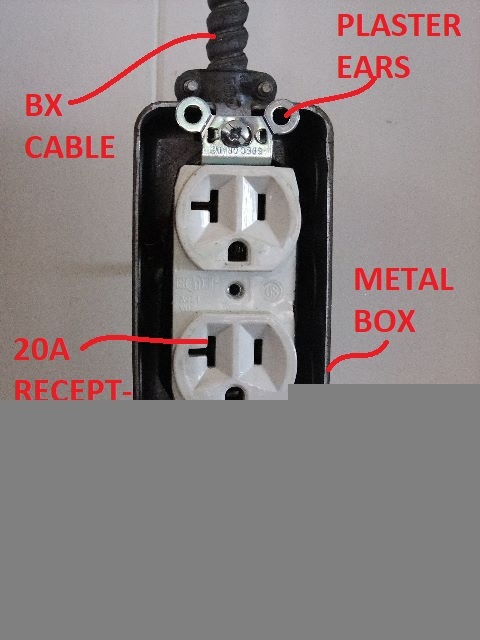 Watch out: When purchasing the receptacles to use on a 20A circuit, be sure to also buy receptacles that are themselves rated for 20Amp use. You'll see that those least-costly receptacles found in a big pile at building supply stores are more likely intended only for 15-Amp use. Our photo (left) illustrates an electrical receptacle intended for use on a 20-Amp circuit. 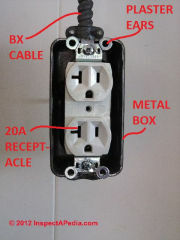 Details about how to wire up an electrical receptacle are at ELECTRICAL RECEPTACLE CONNECTION DETAILS - where to connect black, white, red, green, ground wires. Continue reading at ELECTRICAL RECEPTACLE POSITION: WHICH WAY UP or select a topic from closely-related articles below, or see our complete INDEX to RELATED ARTICLES below. ELECTRICAL WIRE CLEARANCE FROM DUCTS & PIPES at InspectApedia.com - online encyclopedia of building & environmental inspection, testing, diagnosis, repair, & problem prevention advice.